You Can Win A “Game of Thrones” Season 7 Blu Ray/DVD Box! 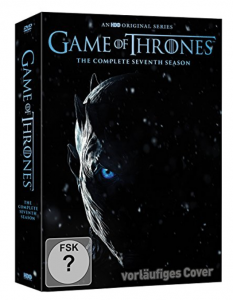 Out of all participants who answer correctly until September 30, 2017, one lucky person will win a Blu Ray or DVD box of “Game of Thrones”, Season 7 (similar to the image below) that will probably come out in December 2017. Please include in your mail whether you would like Blu Rays or DVDs. To be eligible to win, you must reside in a country that Amazon delivers to. I will choose the localised version of the box from the Amazon that is closest to your country. If you should spoil the solution in the comments to this post or to my social media posts about the contest, I will delete said comment, and you will be excluded from a chance to win. Recourse to the courts is not permitted. Have fun, and good luck everyone! This entry was posted in Contest, English, Fantasy, Game of Thrones, Television. Bookmark the permalink.